All I can say to begin my letter this week is that my heart is glad. And it’s glad for two reasons. The first is that I learned that a great number of you went to Davies Hall on Sunday morning to help make sandwiches to feed the people on the streets of Downtown Honolulu and I was so touched not only by that gesture, but how joyful the reporting of it was to me. It made my heart glad to see smiles on people’s faces and I am just so proud of the Cathedral. 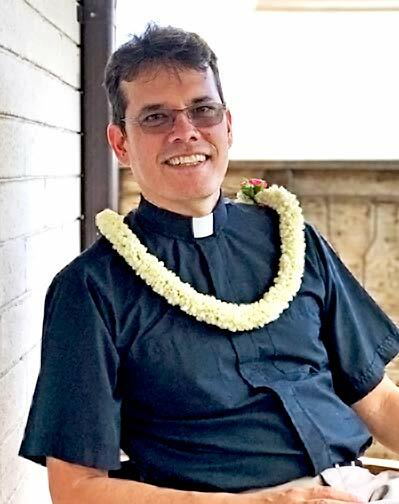 The second reason is that Ha’aheo became a priest on Saturday morning in a service that was full of people who went out to support her, including many, many of you. The Cathedral played a huge role in Ha’aheo’s journey to ordination and the church did a very good thing on Saturday morning by ordaining her. Again, I am just so proud of the Cathedral. We had a full offering of Ash Wednesday services last week that over 120 people attended. I am very pleased with the turnout and it set the exact right tone for me for the beginning of Lent. Speaking of Lent, a number of you have complimented me on the dry arrangement of branches behind the altar for Lent. Please know that while the idea was mine, Matt Brown and Dante provided the Waiawī branches and that Bryan worked to put them together into the arrangement that you see. I feel a need to give credit where credit is due! Please mark your calendars for a workday at the Cathedral on Saturday, April 6th. More information will come out in the eNews and please know that I plan to be there to participate as well as to offer worship that the Stewardship Committee is planning for the day. I have asked Ramona to make me a nametag to wear on Sunday mornings. I’d like to encourage those of you who have them to wear them on Sundays in an effort to learn one another’s names. This comes as a result of several requests I have received to reinvigorate this aspect of our welcoming ministry and in addition, it will help me greatly on Sunday mornings as well. Thank you in advance for participating. A number of you expressed concerns on Sunday that the sound was inaudible. After looking into it, I discovered that half the speakers were off that day. We will work to make sure this doesn’t happen again this coming Sunday morning. My apologies. Please remember that the Presiding Bishop will be with us in the Cathedral at 10:00 on Sunday, March 24 and again at 5:00 for a talk story session with Barbara Tanabe. We will combine the 8:00 and 10:30 services into one service at 10:00 that morning. The 7:00 will take place as usual (and the Presiding Bishop will not be at that service). That is all I have for this week. Please take care until we see one another at worship.